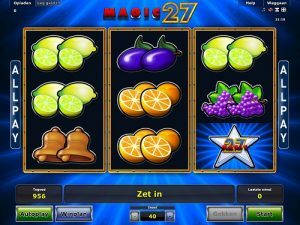 Magic 27 is a classic, retro slot game brought to you by NovomaticCasino.co.uk. Let this take you back to the good old days when slots were simple, fun and not too complicated! This 3-reel slot is exactly what you’ve been looking for if you’ve been searching for some old school fun. Typical slot music and sound effects will delight your ears while you play and win, and familiar symbols will make you feel at home. All in all, this is a great game for any expert looking to go back to basics – where it all started – or any newbies who need some easing in! Familiar symbols grace the reels in Magic 27, including all your favourites, like: oranges, lemons, cherries, plums, grapes, watermelon, golden bells, bars, red sevens, a jester and a Magic 27 star! The aim of the game is to spin three or more matching symbols on consecutive reels in order to get a payout. Every time you get a payout, you can choose to gamble it. All you have to do is have the courage to click ‘gamble’ instead of ‘collect’ and guess the colour of the next card. It’s a classic double-or-nothing gamble feature so, if you guess correctly, you’ll double your win but if you guess incorrectly, you’ll be back to the reels with nothing! Like most other NovomaticCasino.co.uk games, you can play for free until you’re ready to play with and win real money! Your balance, last win and bet amount are all clearly displayed for you on the screen and you can change your bet easily by using the plus and minus symbols. Once you’re happy with your bet, you can put the game on autoplay mode and watch as the reels spin themselves without you having to do a thing! Note that you won’t be able to gamble your wins or change your bet whilst the game is in autoplay mode. There are two special symbols in Magic 27 and these are the jester and the Magic 27 star. The jester symbol is an extra friendly, special symbol and you’ll want him to show up on your reels all the time! He’s great because he substitutes for all other symbols to give you more chances to get wins! Thank you, Mr. Jester! The other special symbol is the Magic 27 star. Not only is the Magic 27 star the highest paying symbol, but three of these will trigger a mystery win! What could it be? Why not play to find out! Here at NovomaticCasino.co.uk, we’re not all about slots and video slots. Although we do have a massive collection, and fans of other games such as: Sizzling Hot Deluxe, Jester’s Crown and Ultra Hot Deluxe will really enjoy Magic 27, we also offer our players a great choice of table games and live dealer games. Our table games such as: Sic Bo, Multiball Roulette, Royal Crown Blackjack, Poker, Baccarat and Royal Crown 3 Card Brag, offer fantastic RTP (return to player) percentages and our live dealer games use the latest technology to bring the real casino vibe to our players at home. You can choose between: Live Roulette, Live Baccarat, Live Blackjack and Live Poker, and play with a real dealer at a real table! Ever dreamt of going to Vegas but never been able to afford it? With our live dealer games, you can feel as if you’re really there and maybe even win enough money to get yourself a holiday to the luckiest place on earth and remember: what happens in Vegas, stays in Vegas!